Did you know that within 20 minutes after you stop smoking your blood pressure and pulse rate will return to normal? Within 24 hours carbon monoxide levels will be eliminated from the body and after just 72 hours your entire blood will test 100% nicotine free. Wow! And, did you know that tobacco smoke contains more than 4,000 chemicals! Many of these chemicals are carcinogens and at least 60 are toxic to the body. Would you knowingly put arsenic (a poison), ammonia, mercury, DDT (an insecticide), nitrous oxide (a disinfectant) or carbon monoxide in to your body? Of course you wouldn’t. But that is exactly what happens when you smoke! Many of the stop smoking procedures, programs and products are designed to help build up the personal power to resist or overcome the addiction. Hypnotherapy does not work at achieving the strength to resist. It is designed to eliminate the desire. Through hypnosis it is possible to change the taste of a cigarette from pleasurable to unpleasurable. Instead of giving up something a person enjoys, the goal is to be rid of something that is not wanted. The ability to visualize one’s self as a non smoker is a major asset and hypnotherapy can help to develop and focus the powers of visualization. Most people do not understand what hypnosis is all about. Their only knowledge comes from what they see in movies and stage shows. While experiencing hypnosis you are neither unconscious nor asleep but in a deep state of relaxation allowing the mind to be focused and open to the suggestions that help achieve your goals. DO YOU KNOW SOMEONE WHO WOULD LIKE TO STOP SMOKING? 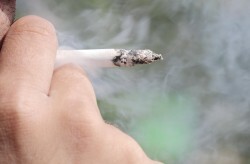 CAN YOU AFFORD TO SMOKE? An Ohio State University study published in the peer-reviewed journal Tobacco Control (June 2013) found that a smoker costs their employer an estimated $5,816 extra per year, of which $3,077 (over 50%) is from lost productivity due to unsanctioned smoke breaks.